Alright, maybe I’m slightly exaggeration here, but I have been known to (from time to time) place many drunk-dial texts, calls and instant messages to friends. OH, and now with Skype and a webcam, well I may drunk dial via internet phone. So, before I divulge even more embarrassing things out about myself (and I must make sure you know who the author is here, cause my husband would die if people thought it was him writing this – it’s Amy, the one who doesn’t write as well but is a hell of a lot funnier, right kids? ), let me get to my point. A few weeks ago, our cyber-friends Diane and Todd, the White On Rice Couple, read a comment I left on their blog and emailed me. In the comment, I so nicely told them I hated them, was jealous of them, and more or less told them to go shove it (exaggeration, again) because they were so lucky to have such a beautiful and vast garden in their SoCal backyard. This jealousy was also fueled by the fact that I was in the throws of a “I’m Freaking So Sick of Winter, Let It Be Over Already” tantrum, so seeing these two frolic in the warm sun in their overgrown, colorful backyard was definitely bringing out my mean-spirited side. But they really are the nicest people and have a really awesome blog. It’s also great to see another couple share blog duties as Jonny and I do here. Again, I’m losing my point. Diane and Todd emailed me to tell me they’d love to send us some of their blood oranges in the mail. I hope to pay them back by sending them some NYC love at some point. I guess my crappy Brooklyn-grown chives won’t travel well, but perhaps some whiting fish or bagels would do? Not sure if they’d ship well. Last Saturday I was told that a package arrived for me. Excited like a 4-year-old on Christmas day (we NEVER get mail), I ripped open the box to find a bunch of beautiful blood oranges nestled snugly in a box with their branches and leaves padding it. Such natural, rustic and beautiful packaging! Alongside was another freebie… mexican freakin’ limes! So cool. All of a sudden I was feelin’ the love. 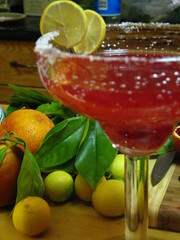 We decided to make FABULOUSLY DELICIOUS Blood Orange Margaritas and were even able to use the Mexican Limes as well. After my second, I thought it was a perfect time to do what I do best, drunk email, which is how I thanked them. It was about 7 lines too long and I’m sure they got a bit creeped out, but Todd and Diane, if you’re reading, now you know a bit more about me. It was the tequila talking!!! But thank you again, so, so much. It is a great way for them to help bring this community together – I know they’ve sent other things through the mail to other food blog owners. Thanks again! 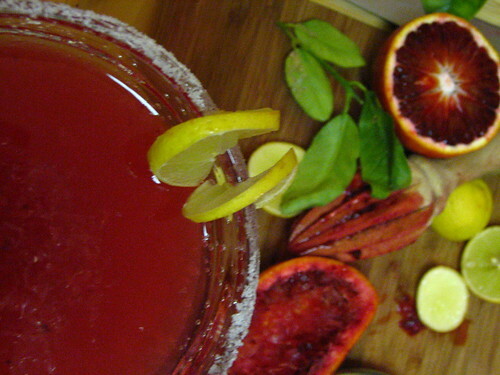 Now get your arse down to the store and find yourself some blood oranges to make these awesome margaritas!! And visit White On Rice! Add everything into a martini shaker filled with ice. Shake your martini shaker and add shaken contents to your salt-rimmed glass. 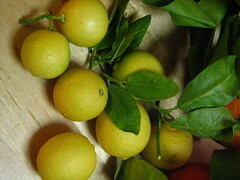 Garnish with a lime or blood orange wedge. Imbibe! Wow, they sent you oranges!!! and limes!! how kind! and your blood orane margarita ROCKS! I’d love to try it for myself. I’m just going to have to aren’t I? i LOVE blood orange margarita’s!! can you make me some soon? ps summer is around the corner! That’s awesome and really nice of them! I have yet to find blood oranges (you wouldn’t think it would be tough in FL…), but those drinks sure sound good! Dianne & Todd Rock!!! THey sent me rosemary not too long ago! I don’t like them either!! LOL! Your drinkey drink sounds good! Anyway, i love the margaritas. They look awesome! Pixie – you totally need to try these. We put in too much tequila (which wasn’t a bad deal), but that’s how I ended up writing them a love note. Mike & bren- they totally rock and were so nice to do that. Mike, i’d imagine you could squeeze a fresh Florida orange and a dash of grenadine in there and you’d be good to go! 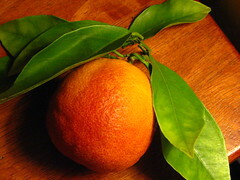 zenchef – you’re jealous of my oranges, i’m jealous of their blood orange tree! try these margs!! At least you didn’t come home, put on a Bee Gees 8-Track, pop a couple ‘ludes, slump into your bean bag chair, and THEN call. um, peter… were you looking into my window last Saturday? peepin’ tom???? how’d you know. now i’m embarrassed. Girlfriend, we’re already LOL from this sober (?) post! I’d love to see what you write when you’ve had a couple of cocktails under your belt! Please don’t hate us because we’re citrus rich, just please, please come on down to CA and party!! You guys are like our best-est cocktail blog-buds! We need to make a cocktail video together! ← News Flash! Patti LaBelle Loves Hot Bags and Hot Sauce!